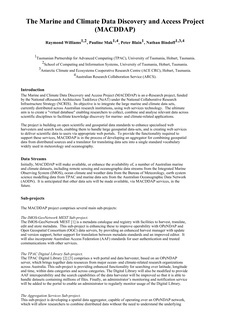 MACDDAP is an eResearch project, funded by the National eResearch Architecture Taskforce (NeAT) under the NCRIS program. Its objective is to integrate the large marine and climate data sets currently distributed across Australian research institutions, using web services technology. It will create a "virtual database" enabling researchers to collect, combine and analyse relevant data across scientific disciplines to facilitate knowledge discovery for marine- and climate-related applications. MACDDAP encompasses a number of sub-projects that are in the process of developing (1) data discovery web services, to enhance current specialised web harvester and search tools so they can search for large spatio temporal datasets; and (2) data access web services, to enable seamless access to such datasets, based on open geospatial and scientific data standards, via appropriate web portals. To provide the functionality required to support these services, MACDDAP is developing an aggregator for combining geospatial data from distributed sources and a translator for translating data sets into a single standard vocabulary widely used in meteorology and oceanography. Initially, MACDDAP will enhance the availability of a number of Australian marine and climate datasets, including remote sensing and oceanographic data streams from the Integrated Marine Observing System (IMOS), ocean climate and weather data from the Bureau of Meteorology, earth system science modelling data from TPAC and marine data sets from the Australian Oceanographic Data Network (AODN). It is anticipated that other data sets will be made available, via MACDDAP services, in the future. The ultimate desired outcome for the MACDDAP project is to ensure that marine and climate data throughout Australia become discoverable, searchable and conformable with standard vocabularies, enabling researchers to collect and aggregate data across disciplines for knowledge discovery.